Hahnemühle’s Report & Art Book with Built-In Pencil Holder offers creative people the opportunity to sketch anywhere. The small, handy booklets in the formats A6 and A5 fit in the pockets of both jackets and pants. Perfectly suited for painting and writing, the pages can be turned completely, at the short side and so, subjects also can be developed and sketched across the binding. No matter if used in portrait or landscape format – the ‘Report & Art Book’ fits the hand nicely. The natural-white paper is hard-wearing – for drawings that are developed, corrected and altered. The structure and thickness of the 130gsm artist paper makes for lively, contrast-rich drawings or colored sketches with brilliant and vibrant colors that don’t bleed through to the following pages. The ‘Report & Art Book’ is suited well for any kind of crayons and even for light watercolor painting. The integrated pencil holder makes sure that ‘urban sketchers’ or ‘daily painters’ have their tools available anywhere and at any time. A small glued-in pocket offers space for small souvenirs such as tickets, business cards or photos. 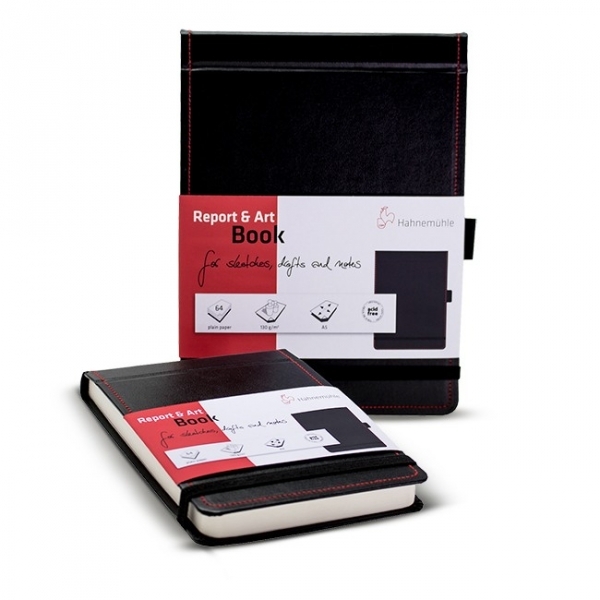 The ‘Report & Art Book’ represents an ideal mobile portfolio in the size of a smart phone or mini tablet for people who love products with a great feel. Also available in 4.1 x 5.8 inch size.